Timely repair of vehicles. Award-winning customer service. Competitive pricing. CID Auto Body and Paint in San Marcos has seen it all when it comes to auto paint jobs. From vehicles that have been in an auto accident to custom paint jobs for those who want to stand out, CID Auto Body and Paint has got you covered. 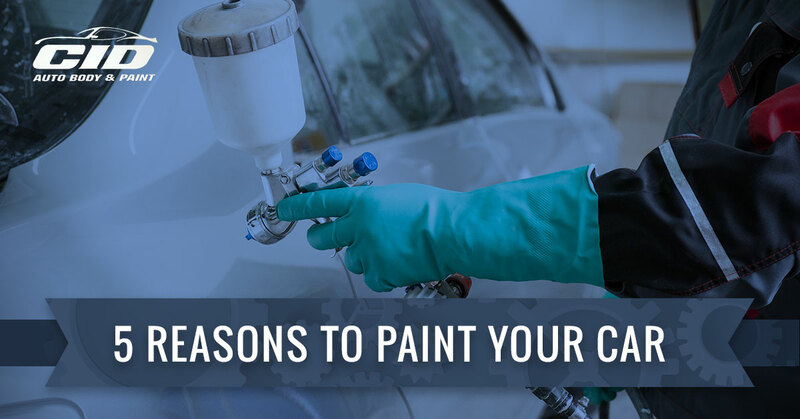 Read below for some of the top reasons to paint your car. To increase its resale value. Repainting your car is in investment in its value, especially if your car is older. Not only will you have a fresh coat of auto paint on your vehicle for your uses, but your car’s value will go up as well. Let’s face it: people buy cars off of looks; if your car looks good, the value is higher than if your car looks old and run down. To hide scratches and rust. Usually repainting your car will hide surface scratches and rust. Auto paint can even cover up dents, gouges, pits, and holes — or at least diminish their appearance. However, auto paint can’t cover major damage to your vehicle. If your vehicle was in an auto accident and needs a new paint job, CID Auto Body and Paint in San Marcos can serve both your auto body needs and your car paint repair needs as well. For safety purposes. Auto paint is not just for looks as most people assume. Auto paint serves an important function outside of aesthetics: safety. Auto paint is designed to prevent structural damage that can happen to the steel of your car over time. Steel has a tendency to weaken over time, and a good paint job will keep your car running strong for years to come. Inhibits corrosion. Another safety point, auto paint prevents corrosion. Steel and metal exposed over time to the elements begins to rust and corrode, which eats away at the steel of your car. A good paint job prevents the elements from reaching the steel structure. This is why it’s important to invest in car paint repair services as soon as a scratch or dent appears. Because you want to. Let’s face it: auto manufacturers have a limited color code they produce vehicles in. This is because odd colors are harder to sell so auto manufacturers stick to the tried and true common colors of what sells: blue, red, white, black, and gray. Any exotic colors, such as purple, pink, orange, yellow, and any other extreme colors on the color spectrum, must be a custom auto paint job. CID Auto Body and Paint of San Marcos is passionate about auto paint. We have bays dedicated to painting all types of vehicles from semis to pick-up trucks to cars. As an auto body shop as well, CID Auto Body and Paint has experience in collision repair and in car paint repair. As the Top Rated Local® Auto Body Shop for San Marcos, CID Auto Body and Paint offers quality, integrity, and outstanding customer service in all that we do. From window replacement and repair to fleet services, we’ll work around your schedule to get your auto paint job taken care of. Contact us today! ©2018 CID Auto Body & Paint® - Do not copy. All rights reserved.